Footy Boots was recently invited to go behind the scenes at Nike’s Football Innovation Summit at its World Headquarters in Portland, Oregon (USA). As you pass through the entry gates, it is the sheer enormity of the Nike campus that first strikes you. Comprising 8000 employees, dozens of futuristic style buildings, an Olympic Size swimming pool, running track and football pitches that would not look out of place at a Premiership training ground, Nike World HQ is the Willy Wonka’s Chocolate Factory of football boot brands. Over the next few weeks, Footy-Boots.com will bring you a range of articles giving you a behind the scenes look at Nike Football. Nike was relatively slow on the football uptake compared to the likes of Adidas, Puma, and Umbro. It was not until the 1994 World Cup Finals in the USA that Nike came out of the footballing shadows and stepped onto the global scene, sponsoring 8 Brazilians, in their penalty shoot out victory over Italy in the Final. Nike made history the same year releasing the first football specific TV commercial entitled “The Wall”. 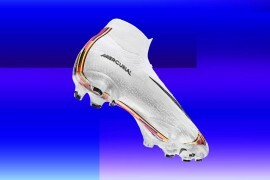 In 1998, Nike released the fastest and lightest football boot at the time, the Nike Mercurial, worn by Brazilian Ronaldo. It increased its number of sponsored teams at the World Cup held in France to five including Brazil, Holland, and USA. 1998 also saw the releases of the Brazil “Airport” TV advert. The next four year cycle culminated in the 2002 Japan/Korea World Cup and an increasing shift towards the internet as a marketing tool. “The Cage” TV advert was released, featuring Eric Cantona, before “Joga Bonito” saw 3 on 3 football being played in 39 countries over an 8 week period in 2006. 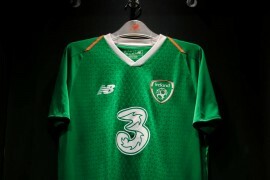 According to Bert Hoyt, Nike GM – Global Football, footballing innovation always has and always will be the focal point of Nike football products. “Innovation is in our DNA” he commented. From the first footballing TV ad ‘The Wall’ in 1994 to the lightest football boot of its time in 1998, the Nike Mercurial, Nike believes it leads the way in footballing innovation. Nike Football – The Future? The future for Nike Football will be to continue to innovate. As Nike’s CEO Mark Parker said “The obsession for innovations is always job number one for Nike.” Nike Football exists to create football boots and products around the player, according to his individual needs – speed, power, accuracy, to name just a few. In 1994, the Nike Football business accumulated 40 million dollars, now it generates 1.5 billion dollars! Nike wants to continue to tell great stories through its athletes, national teams, and clubs, and in future prospects, Alexandre Pato of AC Milan, who scored on his debut in a pair of Mercurial Vapor 4’s, Mexican Giovanni Dos Santos (Nike Tiempo 2) of Barcelona, and Hatem Ben Arfa of Lyon (Mercurial Vapor 4), Nike believes it is perfectly placed to become the most energising and dominant football brand by 2010. Certainly Nike Football sits well placed to fulfil its mission statement of bringing innovation and inspiration to every footballer in the world.